Hudson Town Hall is located at 12 School Street, Hudson, NH 03051; phone: 603-886-6000. Photo: Hills House, ca. 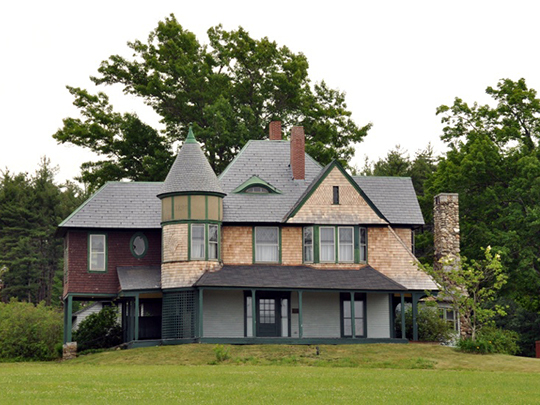 1890, 211 Derry Road, Hudson, NH. Listed on the National Register of Historic Places in 1983. Photographed by user:Magicpiano (own work), 2010, [cc-by-3.0 (creativecommons.org/licenses/by/3.0)], via Wikimedia Commons, accessed March, 2014. The Town of Hudson was formerly part of the Town of Dunstable which was chartered in 1673 as an outpost of the Massachusetts Bay Colony. Parts of the old township broke away as separate entities beginning about 1730. Hudson was known as Nottingham West from 1746 until 1830 when residents petitioned the General Court for a name change to avoid confusion with another Nottingham, New Hampshire. The settlement of what is now Hudson began about 1710. Early on three garrison houses (Blodgett, Taylor and Hills) were built within a half mile of the Merrimack River in the western part of the present town limits to withstand Indian attacks. Settlement in town did not begin in earnest until the end of Lovewell's War in 1725, and by 1733 there was a settlement of about ten families on the Joseph Hills Farm. The first meetinghouse was built in 1733 on the road leading from Dracut to Litchfield (later Musquash Road). When the boundary between New Hampshire and Massachusetts was established in 1746, the meetinghouse was no longer in the center of town so the citizens voted to build a new meetinghouse. The 1733 meetinghouse was then sold to the neighboring Town of Pelham, moved there and used as a meetinghouse until 1785. A new meetinghouse was constructed in Hudson Center in 1748; in 1778 it was sold and removed from the site. Prior to the construction of the Taylor's Falls Bridge across the Merrimack River from Nashua to Hudson in 1827, one of the earliest and busiest ferries was established in 1729 at Cummings Farm in Hudson, running to a spot near the mouth of the Nashua River. At least two other ferries linked Hudson to Nashua including the Hills Ferry in the northern part of town and Little's Ferry at South Nashua. Hudson Center developed rapidly in the late 18th and early 19th Century after the Presbyterian Church or North Meetinghouse was erected in 1771. By 1834, Hudson Center was the primary village center of the town. It contained a tavern, three small stores, a meetinghouse, a physician and eight or nine residences. Other than the small concentration of buildings at Hudson Center, there were no other village centers in town. The construction of several new buildings, including the Hudson Baptist Church in 1841 and the Town House in 1857 reinforced the importance of the village at the center, although by this time the importance of the Center was beginning to wane. The area known as Hudson Bridge, at the eastern terminus of the Taylor's Falls Bridge, had begun to develop as a commercial center as early as 1837, when a store was established there, and continued to develop rapidly during the mid 19th Century due to its proximity to the industrial city of Nashua. By the early 20th Century, the business center of the town had moved from Hudson Center to "The Bridge". The post office moved to the Bridge area in 1910 and the town library moved to the Hills Memorial Library in 1909. The Hudson Volunteer Hose company constructed a hose carriage house at the Bridge in 1892. Library Park and the rest station was established in 1911 for those awaiting the electric cars at the southeast corner of the park. The advent of the electric railways in Hudson in 1895 simplified commuting to the mills in Nashua and accelerated the evolution of Hudson as a bedroom community for Nashua. Agriculture continued to play a major role in the local economy well into the 20th Century. Local farms included both mixed family farms and larger production operations, primarily poultry, apples, and dairy. The U.S. Census indicates that there were 172 farms in Hudson in 1880, ranging from five to more than five hundred acres. In the early 20th Century, Hudson still retained many dairy farms, market gardens and extensive orchards. Even those who worked in Nashua or other urban centers typically kept small gardens and a few chickens. The poultry industry was particularly significant in the 20th Century. The Jasper farm grew to become one of New England's largest breeding farms and Grant Jasper became one of the leaders of the New England poultry industry. At its peak the farm contained over three hundred acres, eighteen large hen houses, and more than 200 portable brooder houses and range shelters. The daily production was more than 25,000 eggs. Town of Hudson, 2006 Master Plan, Chapter VII, Historic Resources, www.hudsonnh.gov, accessed June 2011.